Are you with me? Feeling springy yet? It is happening slowly but surely in my area–a day of sunny gorgeousness and then a few days of the dreary clouds. I see nature changing her coat from brown and drab to colorful and light and it does my spirit good. 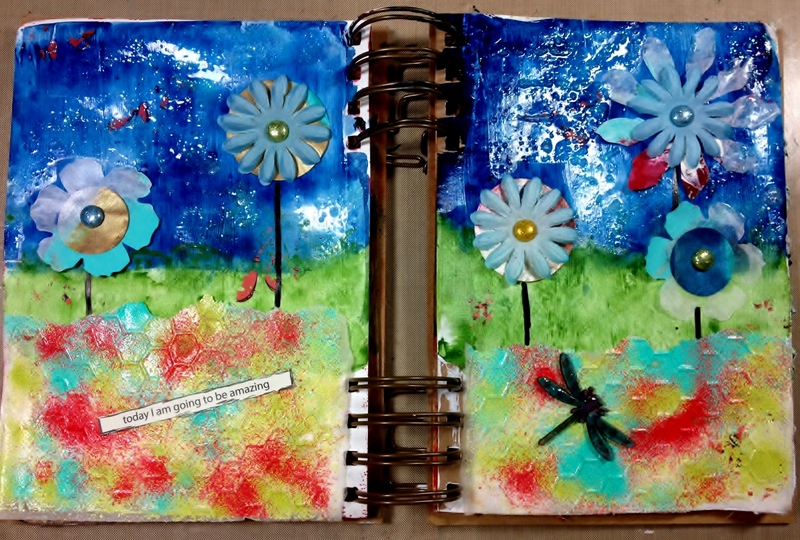 How does the change of seasons affect your art and creativity? For me I notice my color palette changes to more brights and even more sparkle. I always love flowers but I love them even more in spring and summer. 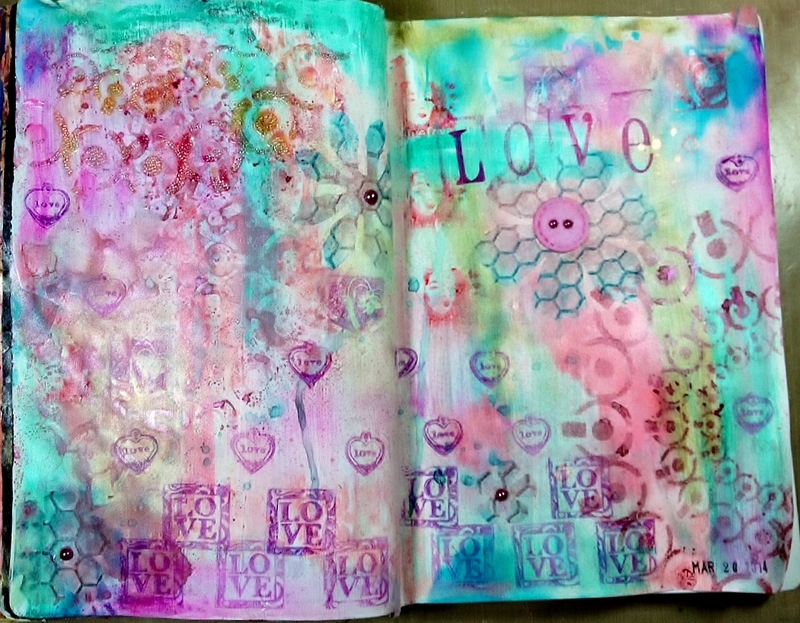 I did the art journal page above for my last video as Swirlydoos Guest Educator for March. 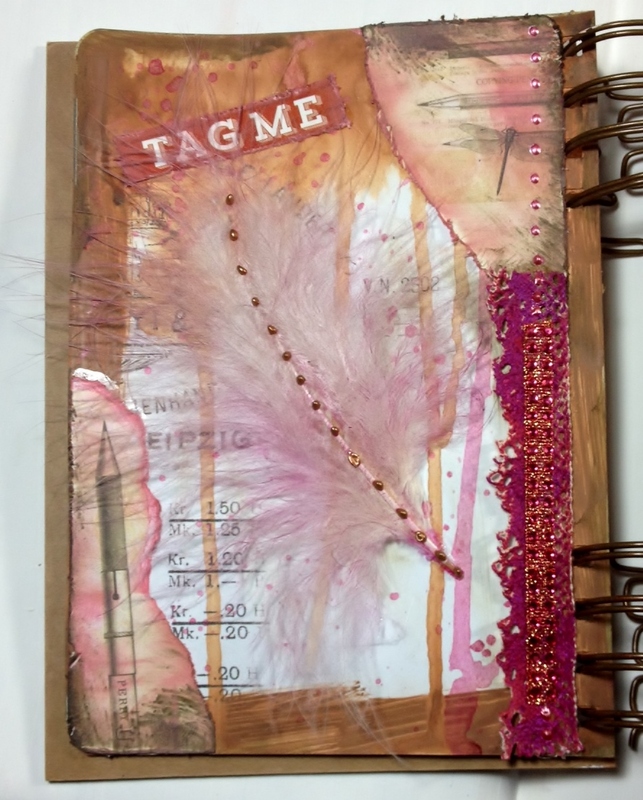 I really wanted to use one of the feathers from the art journal starter kit and some of the printed pages included in the Finnabair art journal. This was a simple page and it was the first time I’d ever colored a feather (I used a Lindy’s Stamp Gang mist held high above the feather so it didn’t get too saturated). Here is the facing page I did simultaneously with this one. 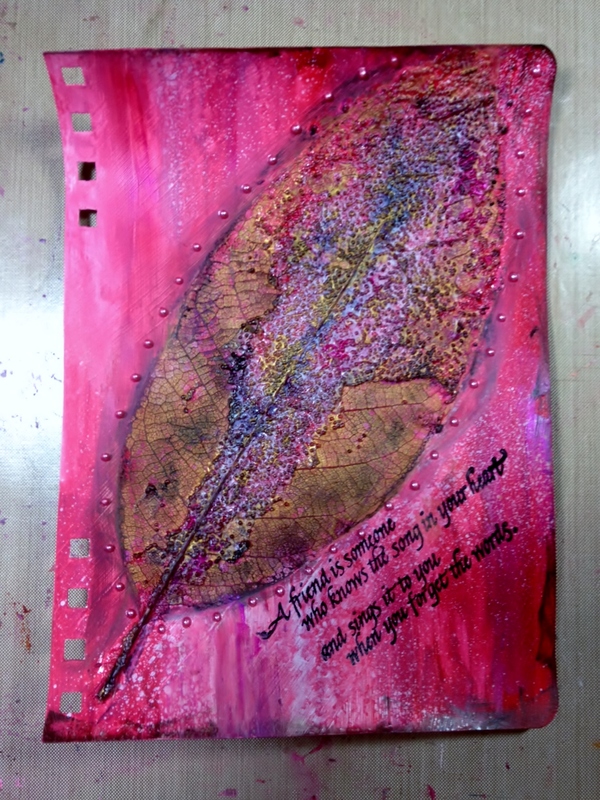 I used a lacy leaf and many layers of mediums for this page. I really like the symmetry of this leaf facing the feather page with their similar sizes and spine down the middle. I cross-pollinated colors from each page to the other as well. Here’s a pic of the pages next to each other. 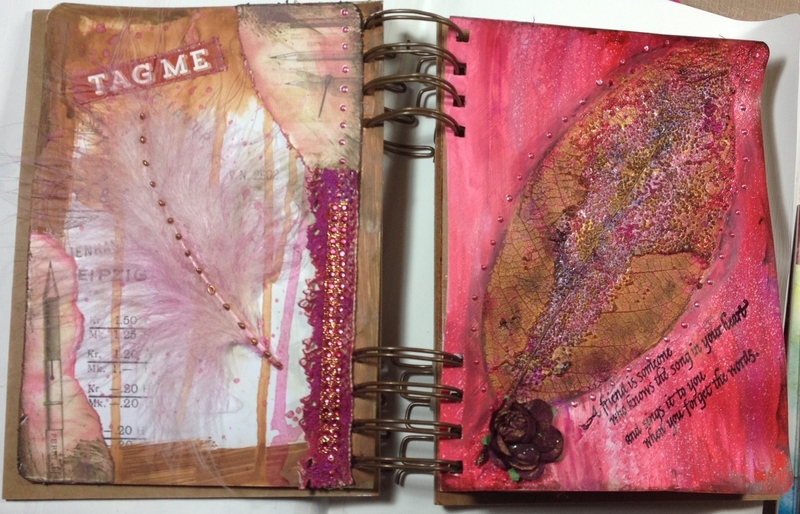 Here is the next page I did in this particular journal–can you tell the season has been changing? I had a great time playing with deli paper and various dry and heat embossing techniques, paints, and glazes. Those bright colors energize me! One of my internet friends is Patti Tolley Parrish of Inky Obsessions. I really like her art endeavors and her videos brighten my day every time I watch them. She recently released a new line of her own stencil designs from istencils.com and they are FAB! I used the Infinity design for this page with both spray mist (bottom right) and with glass bead gel (top left). The background was done with all Gelatos and the flowers are embossed and inked deli paper. 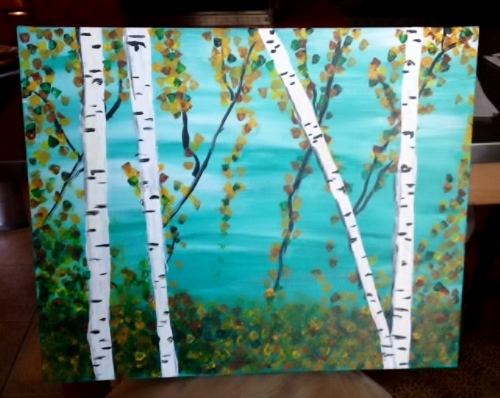 Lastly, I went to a paint and sip painting party a few weeks ago and did this painting. It was hugely fun to go with some girlfriends and follow along the step by step process. Don’t look too closely or the illusion that I am any kind of painter will be broken–haha! Thanks for visiting and sharing part of your day with me!